Three days’ earlier we had entertained a walk that was a little trickier than we had anticipated from the guide. 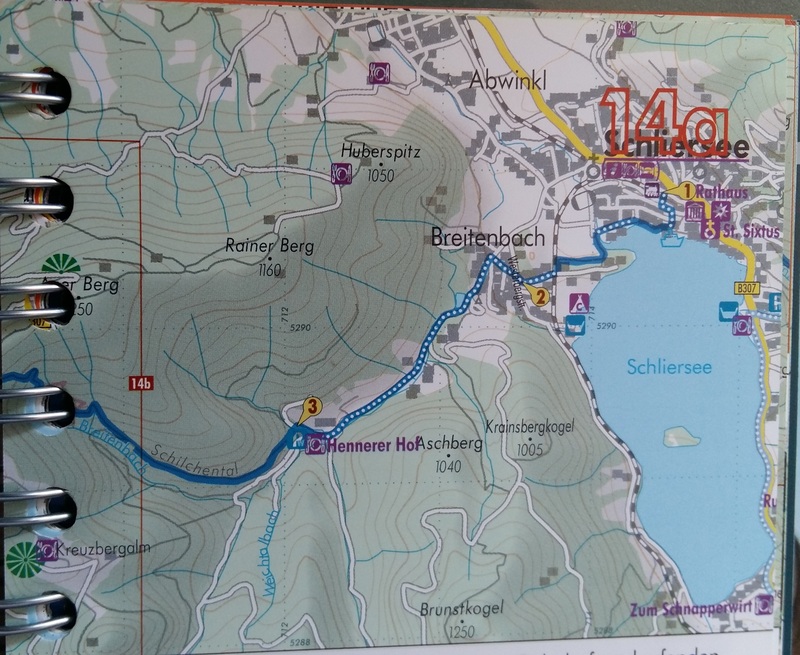 Fo r this walk we decided to tackle a point-to-point walk Schliersee to Tagernsee. 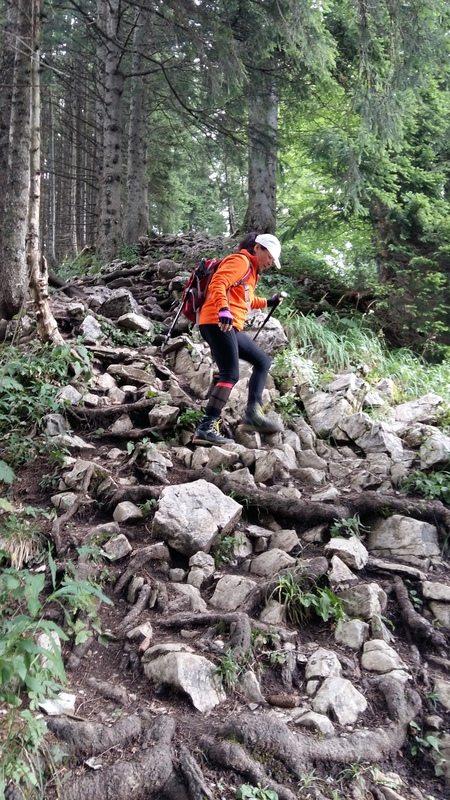 A total of 12.1 km mostly on gravel hiking paths with a 580m ascent (we think it was a little more than this). The first part is forest – wonderfully cool, if a little monocultured. Hennererhof is the end of the navigable path by motor vehicles. The walk continue s through the forest and emerges for a 30 minute ascent to Gindelalmschneid. The view to the north looks to the flatlands towards Munich (just visible on the horizon). 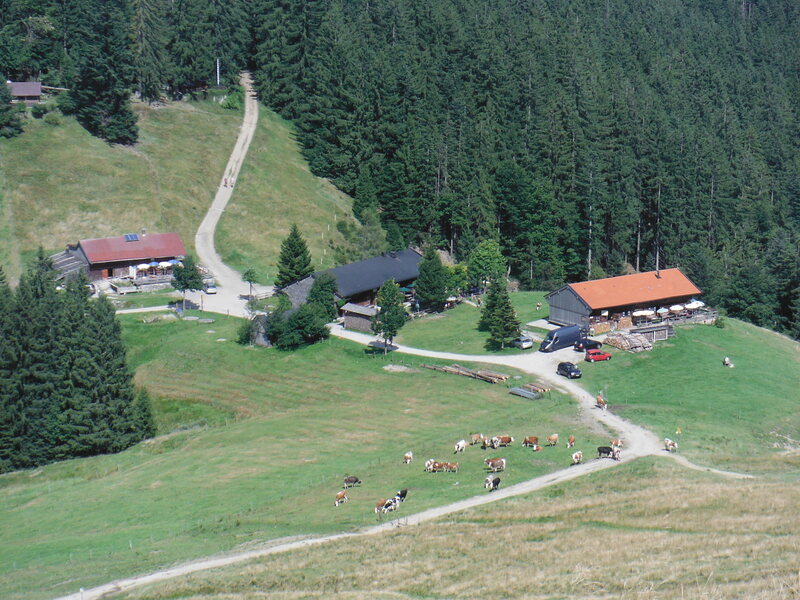 The Alm is tucked in to the landscape below the peak (right). 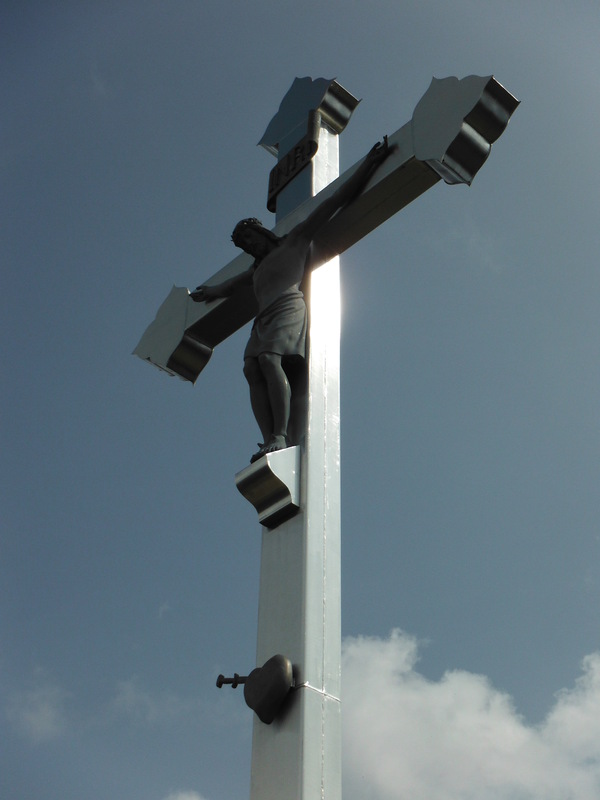 We took food with us and enjoyed it on a bench next to the Crucifix, the ever-present feature of alpine peaks. 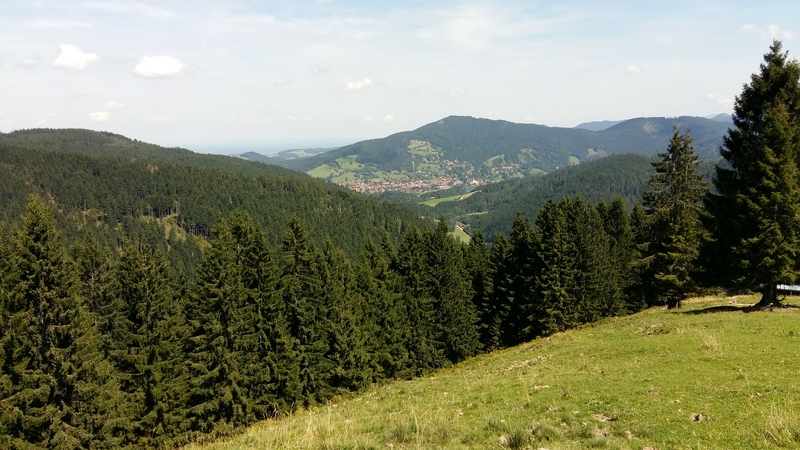 Onward towards Tegernsee (left). More forest, but also exposed expanses of meadow with views (right). 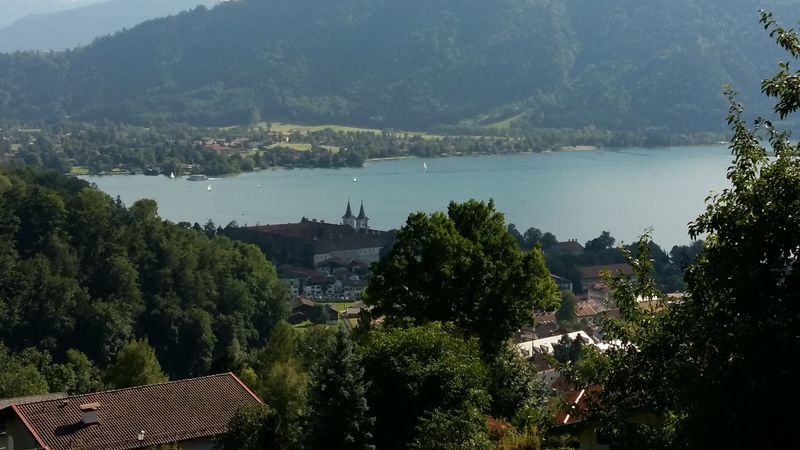 There are no grea t surprises, but the approach to Tegernsee has one anticipating a beer at the town’s brewery which, seemingly, was the old monastery. It is an imposing building and can be seen from a distance (left) with its two towers and inner courtyard. The beer is good, too. On the outside benches, we had a dark beer (5 per cent, right). So good we had two which was enough to facilitate a rather too blase walk to the railway station in relation to fast-moving cars! Great walk. Peaceful. Not too strenuous (though the final ascent to Gindelalmschneid can set the pulse racing if needed). The lake itself was benign and evocative. A very nice place to sit and wind down, though it is a wealthy town. A small apartment will knock you back 500K Euros. Best just to visit. The common myth is that German railways are efficient and reliable. I’ve been using Deutsche Bahn for many years. The InterCity services are brilliant. The coaches are roomy, there’s Wifi, sockets, etc. The Regio Bahn is also pretty good, especially if you have a bicycle – well designed and accessible platforms in most cases. However, some of the routes are being privatised/franchised. 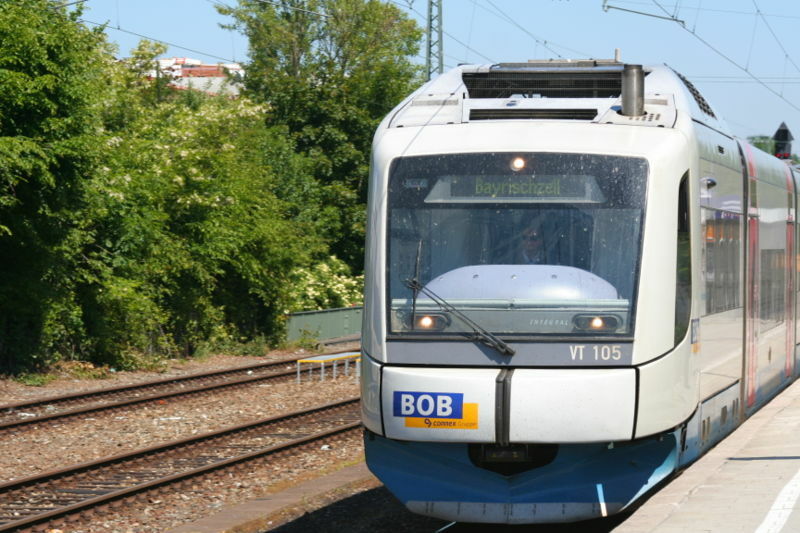 So, yesterday we used the BOB – Bayerische Oberlandbahn, a subsidiary of Transdev, itself formed out of the former operation of Connex and Veolia. BOB is a curious network. It leaves Munich Hauptbahnhof as three, two-car units – each unit detaches at various points and completes journey to Lenggries, Bayrischzell and Tegernsee. The return journey is made of attachments that are completed at Holzkirchen. Yesterday, however, the service left Hauptbahnhof in short formation arising out of a failure of a unit and no suitable replacements. The train was absolutely packed and left elderly passengers standing for over one hour. As is normal in the UK when this happens, there are no conductors to be seen. The chaos had to be self-organised. To be fair, buses were provided for those going to stations towards Lenggries on arrival at Holzkirchen. Whether this is symptomatic of the hollowing-out of the network, it is difficult to say. But what chance that if Deutsche Bahn had operated the service, there would be a possibility of an additional unit being available? Is this just a case of “sweating the assets”? 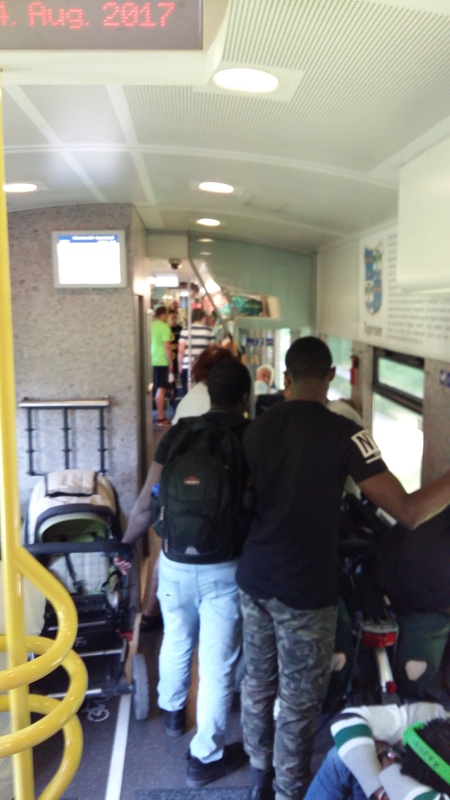 But if that were not enough, on Monday arriving back from Neuhaus (on the Bayrischzell route), the Munich S-Bahn (short-haul network of 8 routes each passing through the centre of the city), not for the first time, collapsed. Not clear why, but chaos nonetheless and very little information other than platitudes. Then it is reported that the line between Rastatt und Baden-Baden is now out of commission due to tunnelling operations. This might seem trivial, but this Rhine route south of Karlsruhe is a significant part of the German railway network linking the north to Switzerland. 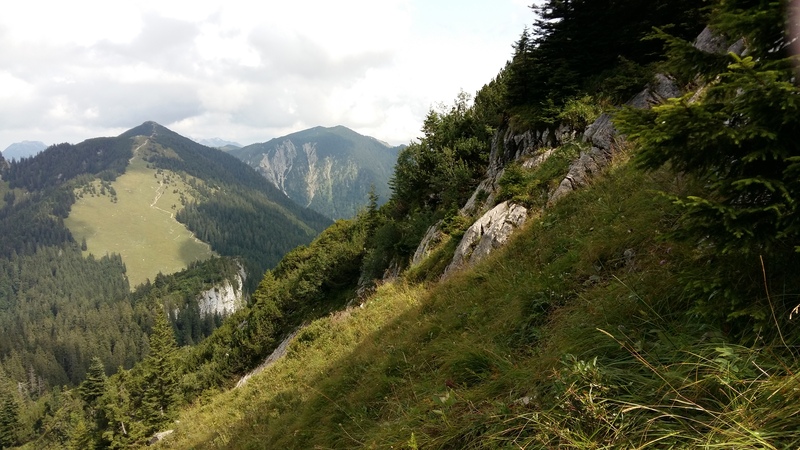 We were planning something similar to what we did a couple of years’ ago – Danube, Altmühltal, Taubertal and Maintal. In the end, we decided to mix cycling and walking. From our base in Munich we are tackling a few Alpine climbs and cycle-route classics. 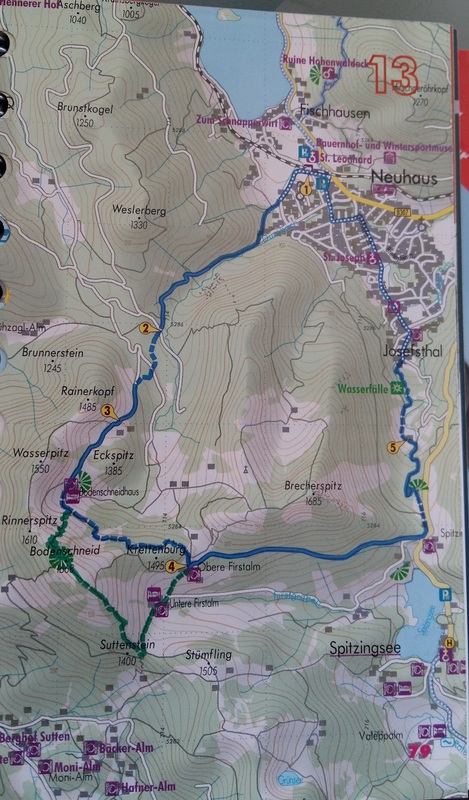 First up for walking, a circular walk featuring a peak called Bodenschneid (1668m). We are using the Hikeline Wanderführer (autho red by Katharina Spannraft) as our guide (left). I sense that Ms Spannraft thinks that the German Alps are a bit tame. They are far from that. We took the train to Fischausen-Neuhaus from Munich. It takes about one hour from Hauptbahnhof. The signage is very good – yellow signs with particular routes captured by coloured dots (right). Navigation, then, is not so difficult; though in bad weather, one would need to be very attentive as some additional green signs are, by definition, not so easy to see. 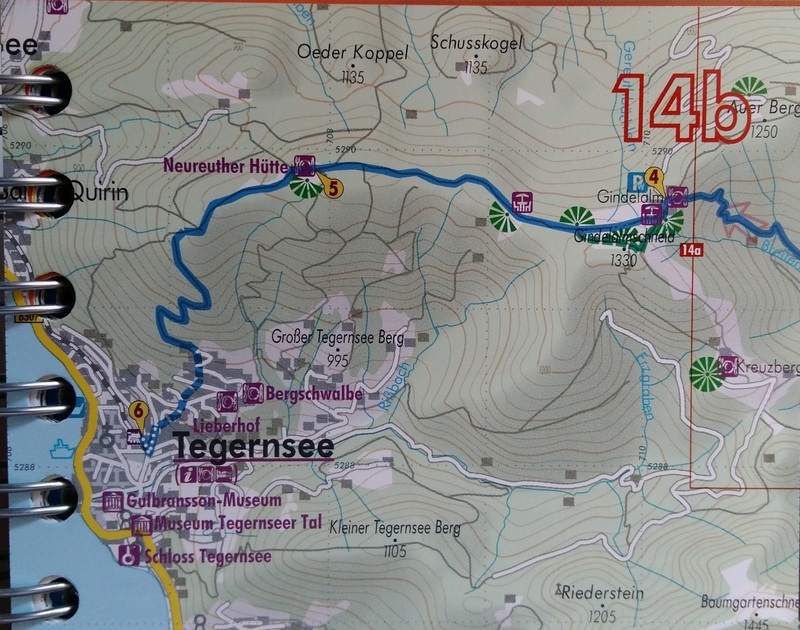 The first part from Neuhaus to Bodenschneidhaus (a welcome Alm eating house) is pretty simple – though the gradient is not trivial. The path is well defined and and made of stable gravel. However, from thereon, if the plan is to go to the summit, the path becomes less well defined and variously slippery, steep and ambiguous. At times of heavy rain, I suspect it becomes a river (left). At one point, the path is made up exclusively of exposed tree roots. At the peak, of course, there is the obligatory cross. Bodenschneid’s is pretty impressive. And modern (right). As are the views (the sun thwarted my attempts at a good summit photo). 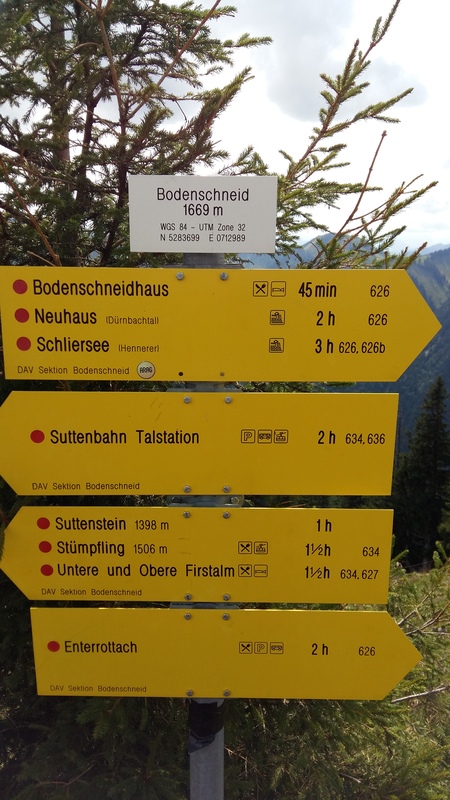 The signs to the tantalising Untere and Obere Firstalms were there at the summit. The route down is precarious and a stick is a major help as well as appropriate footwear. 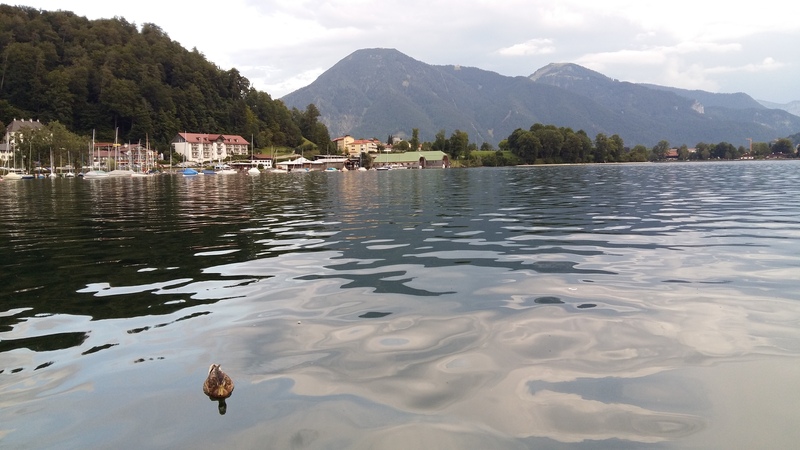 We stopped at the Obere Firstalm – and we are glad that we did. Not only was the food ridiculously fine and generous (we had a vegan stuffed pepper), but necessary to complete the walk despite earlier sandwiches. The route back starts with a steep track cut into the side of the hill. For about 50m one joins the road but very quickly goes left into the forest in the direction of Josefsthal. 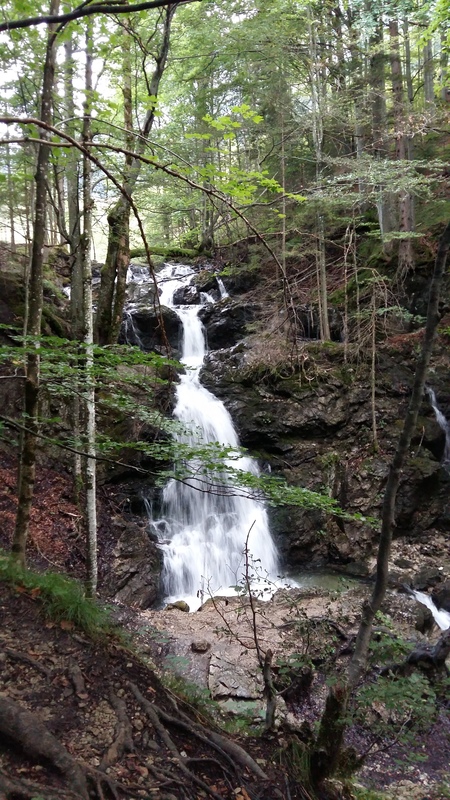 The forest is dense, but one is rewarded by a waterfall (right). The walk through Josefthal is dull. We missed the train by 6 minutes. They are hourly. There are no pubs – though there is a restaurant just to the South that seemed pretty busy when we passed. I have just arrived back in Brighton, England, from my most recent visit to Munich. A favourite pastime there is photographing and commenting on cigarette advertising. It never ceases to amaze me. Not so long ago I wrote a piece called Raddled Old Man (right) where the assumption is that if you smoke you will eventually turn into him having been a handsome chap (above left). Such is the impact of these lethal products. 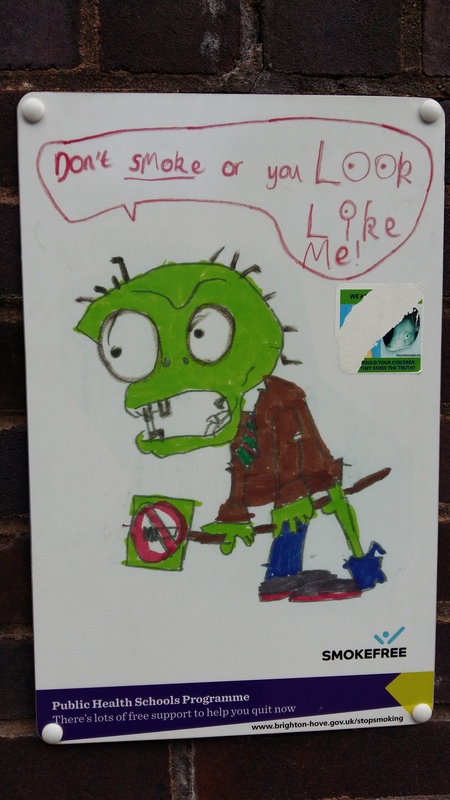 Well, the children in Brighton have got it all sussed (right). Good for them. 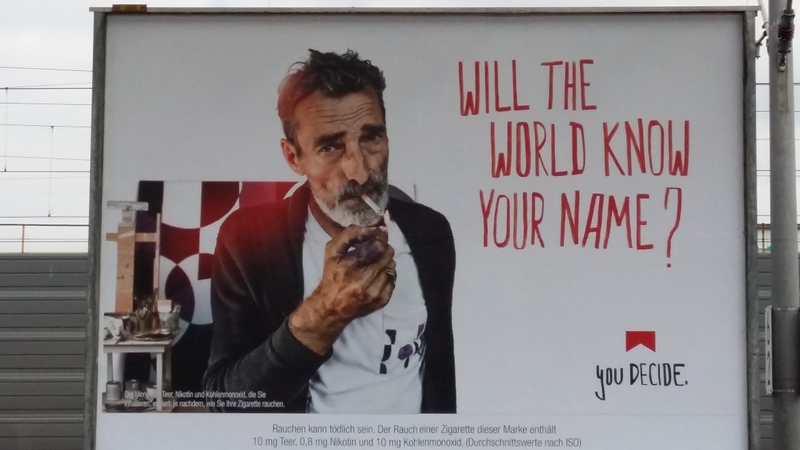 It is the summer of cool in the world of cigarette advertising in Germany. JPS has got this Blue Stream nonsense. Blue in cigarette packaging is usually menthol, i.e shite. 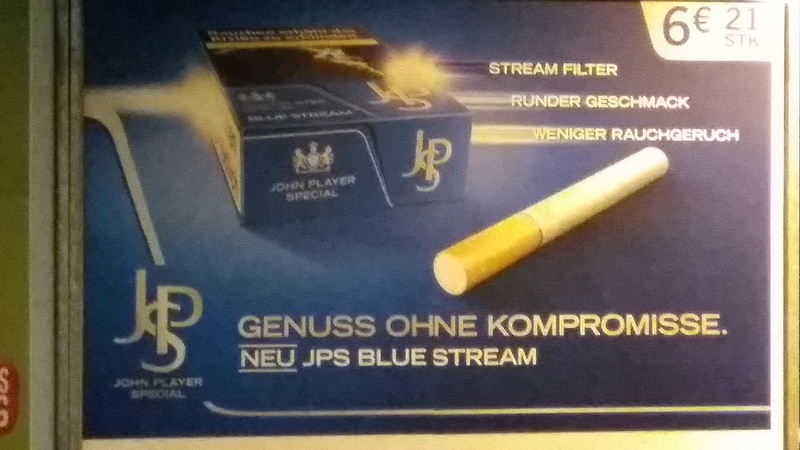 So it looks like they are trying to market a rubbish cigarette type as taste without compromise (presumably this blue stuff usually entails compromise on taste). So, there’s this new filter, a rounded taste, whatever a rounded taste is, and less smoke – a kind of smokeless cigarette, similar to smokeless fuel introduced in the UK in the 1950s to combat smog. The second variation on this product has the strapline “Die hat es in sich”. I am not sure this translates very well…”it has it in itself”? Up itself, perhaps? 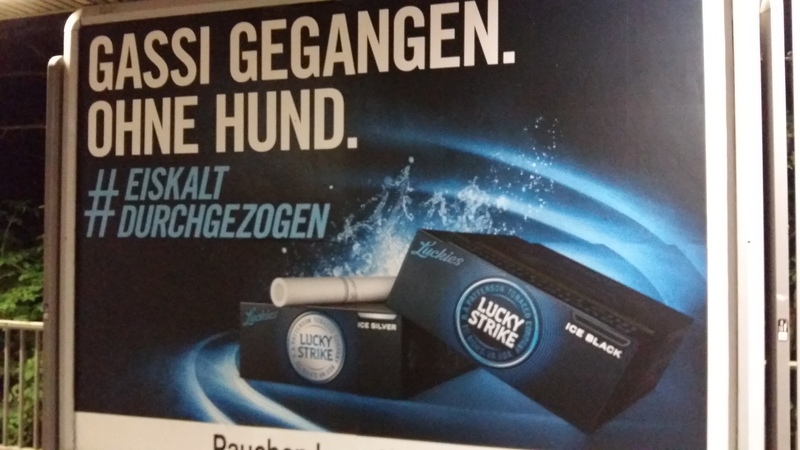 The Lucky Strike blue campaign really thinks it is clever. 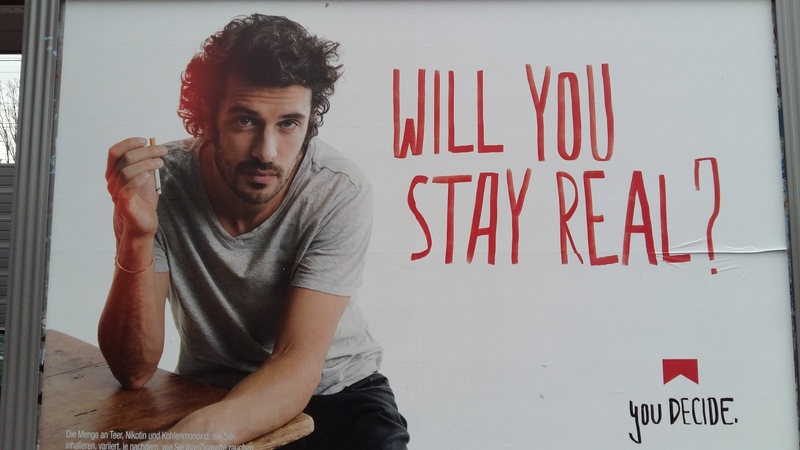 Here we have the strapline that translates as “take the dog for a walk without the dog”. Stunning.